Editor’s note: This story is reprinted from the February issue of GCU Magazine. To view the digital version of the magazine, click here. … My LopeLife is a GCU Magazine feature in which students and staff share enlightening experiences about life at GCU. To be considered for a future My LopeLife, please submit a short synopsis of your topic to GCUToday@gcu.edu with “My LopeLife” in the subject field. Little girls are expected to play with Barbie dolls and chase the neighborhood boys, but I had other interests that might have raised some concerns: I was constantly curious about the homeless and how life on the streets worked. I never understood the concept of someone having only the concrete to call home, and I was determined to understand why it happens. I always have believed that understanding someone’s story can completely alter the way we look at the individual. As time went on, my interest never has changed, and when I arrived at Grand Canyon University, I knew I had found a home when I felt this overwhelming support to follow my passion. Even if others didn’t understand it, I made it my mission to change their perspectives of individuals who are homeless. In October 2016, I started my blog, Can You Spare a Story, in my freshman dorm room. With a camera and notepad in hand, I went out to speak with members of the homeless population to find out who they are and what I can do to help them be who they aspire to be. Can You Spare a Story started simply as a blog to end the negative stigma attached to the homeless population by providing real-life stories of the homeless right at your fingertips. In the last year, we have shared the stories of 25 incredible individuals who are struggling to get by. Can You Spare a Story is more than just interviews with the homeless; it’s making genuine connections with those who are normally overlooked. I have met dreamers, creators, mothers, fathers, veterans, singers and just about every other type of person you can imagine. The truth is, they are all just like you and me. With 10,000 followers on our blog, Can You Spare a Story saw an opportunity to truly change the relationship between the average individual and the homeless. With help from my professors, my family and my homeless friends, Can You Spare a Story became a nonprofit organization in the summer of 2017. On July 29, the Can You Spare a Story family celebrated its first event as a nonprofit, the Can You Spare a Story Priceless Pop-Up Shop. Words cannot describe the excitement we felt as 30 volunteers helped us serve more than 150 homeless individuals. In the months leading up to the event, we collected more than 400 bags of donations from local businesses and families across the Valley. Working hand in hand with the Care Complex, we provided a tailor-made shopping experience without the worry of cost. This gave those who otherwise would not get a choice of what they wear an opportunity to express who they are and who they want to be through the clothing they now wear proudly. During the Priceless Pop-Up Shop, we collected 38 stories of homeless individuals. This is where I met one of the most influential individuals, Melissa. She is a homeless woman who lives on the streets with a group of other women who support one another. She showed me what it means to have community in a time of pain and how to remain confident when things fall apart. She is one of the reasons Can You Spare a Story is still afloat. In December, we celebrated our second event as a nonprofit. The Can You Spare a Story family is constantly amazed by the volunteers who show up and make our events come to life. In 39-degree weather, our volunteers stopped at nothing to make this shopping experience a life-changing one for those in need. This time, we provided a personal shopping experience for more than 250 homeless men, women and children. A Can You Spare a Story volunteer opportunity is unlike any other, as our volunteers have explained to us. We encourage our volunteers to truly connect with those we serve to change their perspective of the homeless community. We are completely blown away by the connections made between our volunteers and our friends who are homeless. All of our volunteers have made us proud to call them members of the Can You Spare a Story family. In the past year, so many incredible talents have come forward to help us break the barrier between the homeless and the public. We recently launched our new website, which includes an online store where you will be able to purchase Can You Spare a Story merchandise while supporting the homeless. All proceeds go toward serving the homeless population, and wearing the brand proudly shows your support of our cause. As Can You Spare a Story continues to grow, so does my passion for the homeless community. A passion project has nothing to do with the individual who runs it but everything to do with those who are so deeply influenced they feel the need to hop on board. Our organization works tirelessly to provide our readers with understanding and our homeless clients with the feeling of individuality once again. To tell you my story, I must tell you theirs. To get involved, visit www.canyouspareastory.com. Sydney Grover is a GCU sophomore who is majoring in psychology with a minor in entrepreneurial studies. 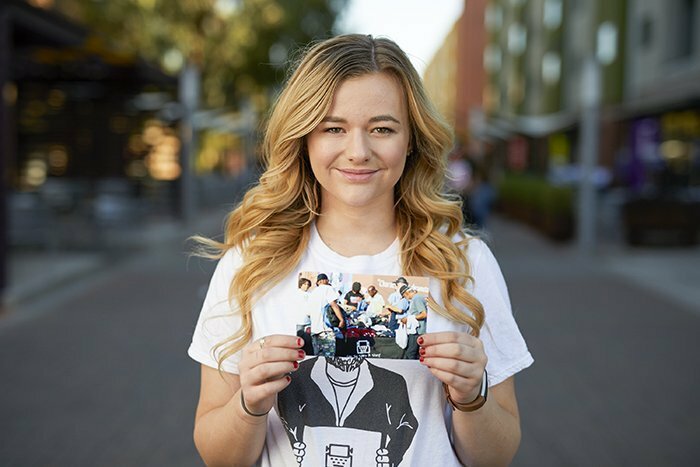 Originally from Las Vegas, Sydney has found a place to call home at GCU by getting involved with student leadership on the Canyon Activities Board Commuter Team. In Sydney’s free time, she enjoys thrift shopping, writing and photography. As I read your story today, I was so very proud of you, because of what you are doing for those people that are less fortunate than us. God, has put a special calling on your life and to be so young and to have the courage to go out to assist these people, proves that God does work through people. He will bless you and take care of you as you do this mission that He has laid on your heart to do at this time in your life. GCU is a very special to be, to meet such awesome people who are always willing to assist you in any possible so that you may meet your life purpose and be a blessing to others now and in the near future. Sydney, thank-you, and God bless you always in all that you do now, and during your lifetime. Dear Sydney: I am the CEO of Central Az. Shelter Services, Arizona’s largest temporary emergency shelter serving people experiencing homelessness. Would love to connect with you and invite you to tour our shelters. There are so many needs and we must all partner together for lasting solutions. We have some projects where we could use your help and ideas. Thank you for what you are up to.